Bariatric Heavy Duty Wall Mounted Bath Board. A heavy duty bariatric bath board that won't let you down, this product is suitable for users up to 30 stone or 190kg. One side mounts to the wall for additional security and the board is constructed from strong steel coated in plastic for moisture resistance. The tough plastic seat has plenty of water drainage holes but is still designed to provide comfort for larger or obese users. 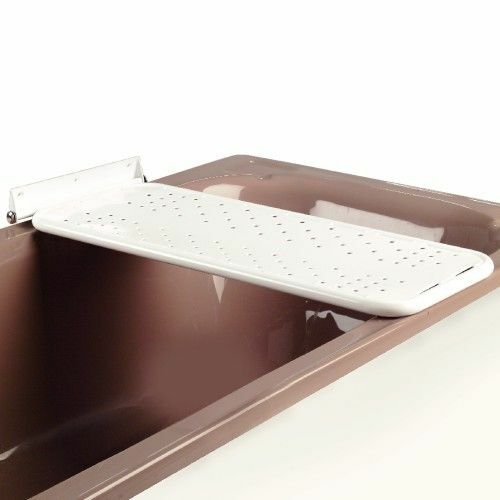 A bariatric bath board is a very simple solution for those who may have difficulties bathing or who may be at higher risk of slips and falls. Installation is easy and once in place, this product will provide plenty of support. The wall mounting means it can just fold away when not in use. I am pleased with the look of the product but cannot comment on its use as it has not yet been fitted. I was very satisfied with efficiency of your company. This bath seat is brilliant! It is hinged, with a flange, so it folds up neatly against the wall when not in use. This isn't clear from the description/photo. You supply your own screws/fixings (3 for the seat, 1 for the flange) suitable to your wall. We have an old, cast-iron bath and other bath boards did not fit, or slipped off the contoured edge. It just protrudes slightly over the edge of our bath so you can sit on it and then swing your legs over into the bath (if you still can). It's not slippery - my last bath seat was (had to put a towel over it to stop sliding about). I am very pleased with it; it had got to the point where we were thinking very expensive bathroom re-fit but this will keep me going for a good few years yet. I am no lightweight but the seat is very strong indeed and I feel very safe on it - showering has become a pleasure again.